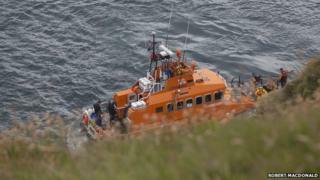 Image caption Lifeboat crews resumed their search for the car early on Thursday morning. Police divers have recovered a body after a car is thought to have plunged 200ft off a cliff in Caithness. A coastguard helicopter and lifeboat were called at about 13:19 on Wednesday after reports of a car in the water at Duncansby Head. However, rescue services were unable to recover the vehicle as it had moved into deeper water. The operation was stood down overnight, but police divers resumed their search on Thursday, assisted by Wick Lifeboat. Police later confirmed that the body of a man had been recovered. A spokesperson said: "Enquiries are ongoing into this matter and no further information is available at this time." An Italian tourist had called the coastguard on Wednesday after seeing the car on a ledge under two metres of water.